Manhattan high school students from Upward Bound and Talent Search programs came to Columbia last winter for workshops and discussions on how to pursue their goal: College. In 1965, two Columbia College students had an idea for a project that they felt would provide a common ground for youth from Upper Manhattan communities and students from the "Ivory Tower." The project's name was Double Discovery. This year as the Center celebrates its 35th anniversary, it is evident that the need to bridge the gap between talent and promise and higher education for low-income and first generation college-bound New York City youth is as strong as it was over three decades ago. The Double Discovery Center (DDC) is an academic enrichment program that helps New York City students, particularly those from the communities surrounding Columbia University, to graduate from high school and college at a rate significantly higher than the national average. The high school graduation rates for African Americans and Latinos, the populations primarily served at the DDC, are 70 percent and 55 percent respectively. But of those who participate in DDC programs, 96 percent graduate from high school and 66 percent obtain their four-year college degree. This is significantly higher than the national rate for college graduates, which is 46 percent. Many DDC alumni go on to become doctors, lawyers, teachers, business executives and community leaders, and many others, as seen among those recognized by the DDC during the 35th anniversary celebration, remain active in the DDC in their adult lives. "It is our mission to uplift and educate the young people of New York City," said Olger Twyner, executive director and president of the DDC. "We are grateful for the large numbers of volunteers and friends, many of whom have participated in the DDC in one way or another over the years. Without their commitment, this program would not be possible." Since DDC's inception, some 30,000 high-school-aged participants have been taught about colleges and careers, encouraged to improve their academic work and gained a better sense of self through personal development workshops and programming at the DDC. But these are not the only youth who have benefited from the program. Generations of Columbia students who have tutored and mentored Double Discovery students have also been profoundly affected by the experience and for some their lives were changed because of it. Roger Lehecka (CC '67), one of the two founding members of the Center who later went on to become Columbia College Dean of Students and is now Director of Alumni Programs, was one of those students. Lehecka and partner Steve Weinberg (CC'66) formed the Double Discovery Center as a place for mutual learning. According to Lehecka, the title of the center was chosen carefully, and it has been meaningful ever since. As high school students improved in academic disciplines, their college tutors learned more about the lives and struggles of New York City teenagers. In the beginning Lehecka thought that the program offered a solution to social ills that plagued a large sub-set of students in New York City schools. "If someone had told me 35 years ago that the Double Discovery Center would still be here today, I would have been shocked. We thought that once we showed struggling students were smarter than high schools thought them to be, the schools would change. But today it is evident that the need for such a program remains." With the supervision and guidance of James Shenton, former Columbia professor of history, and the assistance of Columbia alumnus Arnold Saltzman (CC'36), the DDC received federal funding in 1965. The "Project Double Discovery," as it was then known, began as an experimental summer program, one of 18 similar pilot programs throughout the nation. That first summer 160 low-income high school students came to the Columbia campus for summer academic programming. It quickly became the most popular student group on the Columbia campus. In 1966, with additional federal funding, the Center began the Upward Bound program, which gave over 300 students access to year-round academic programming. In 1977, the DDC expanded to include a second federally-funded program, Talent Search. 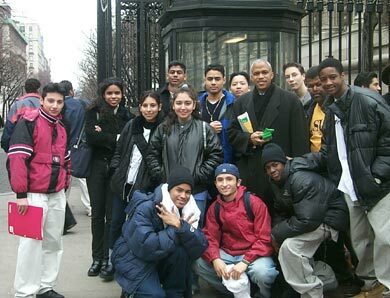 According to Dr. Shenton, the objective was "to take the students who had been identified by the [New York City] Board of Education as potential college material and assume that giving them the chance to go to college was the way out" of a cycle of poverty and social unrest that many low-income families struggled through in the 60s. Today the DDC serves approximately 1,000 students in grades 7-12. The profile of program participants has not changed much over the years. Most DDC students either live or attend school in Upper Manhattan area. To qualify for the largely federally-funded program, students must be either low-income or first generation college-bound. And the fundamentals are the same. "The DDC still serves very bright promising students, who without a program, might not be successful. That is the bottom line," said Lehecka. But perhaps the change that Steve Weinberg and Roger Lehecka envisioned all those years ago is on the horizon. According to Double Discovery's keynote speaker at the recent 35th Anniversary Celebration, Senator Charles E. Schumer (D-NY), a plan is being drafted that could increase resources for schools. This "Marshall Plan" will include strategies for teacher retention, recruitment and training. "We need to help schools get better at counseling," said Schumer. "We need the federal government to help share information among schools so that the good schools can teach those schools not doing very well how to counsel better." This year, the following DDC alumni and staff were awarded Jim Shenton awards of excellence on the occasion of the 35th anniversary celebration: Helen Lowenstein, for individual service; Marvin Cabrera for the alumni award; Lakiya Burrell, DDC student for exceptional achievement and Linda Gilbert, who has served the DDC for 20 years.